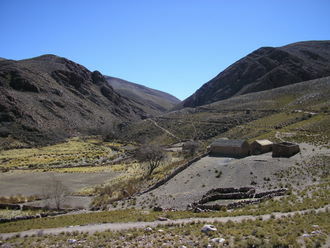 To explore the rugged Argentine countryside of the Quebrada requires a four-wheel drive vehicle. Many of the roads are unpaved, twisty and narrow. Unless you are familiar with driving in these conditions, I highly recommend booking an excursion with a local tour company. The variety of tour companies run the gamut from small busses that carry up to 24 people to Land Rover-type vehicles that accommodate four and a driver. Personally, I like very small groups. Ask your hotel for their recommendations. We were lucky in meeting another couple who wanted to visit the same places allowing us to split the cost of the excursions - AR$130 (US$35) per person for each excursion (both 12-hours long). The journey to Iruya stopped first at a monument marking the Tropic of Capricorn, an interesting travel curiosity, but a short distance beyond is the tiny, ancient village of Uquia. 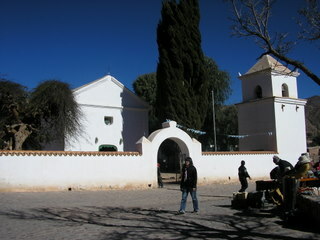 Surrounded by towering cardones cactus and the red walls of the Quebrada, at its center is the historic 17th century Iglesia de San Francisco de Paula, little changed in the past 400 years. Inside is a priceless 17th century collection of the Angeles Arcabuceros (Angles with Guns). 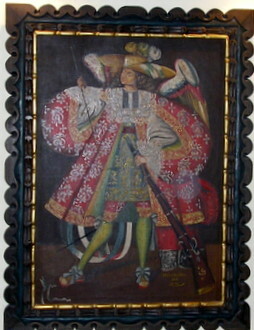 The paintings depict winged anglesfully dressed as conquistadors baring guns and swords - not too subtle Spanish Colonial propaganda. Such paintings are rare and well worth the stop. 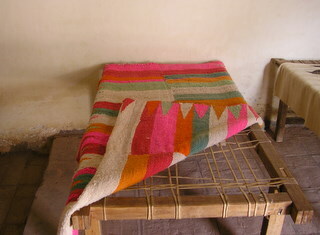 (Unfortunately, interior photos are not allowed). 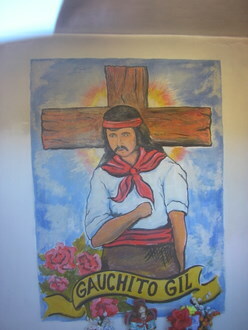 The next stop, at my suggestion, was at a road side shrine to folk hero Gauchito Gil. Throughout Argentina, shines to this 19th century gaucho Robin Hood are visible on rural road sides identifiably draped with red banners. He is especially revered in the North where he led a peasant rebellion against landowners, was captured and executed. 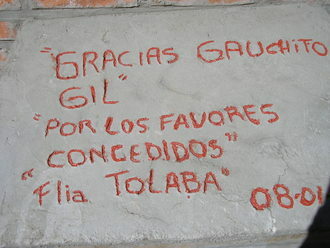 Numerous miracles have been attributed to Gauchito Gil, and he has a large cult-like following. 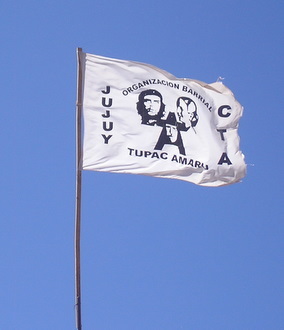 At other villages I saw the labor union C.T.A's flag with the odd triumvirate of Che Guevara, Evita Peron and Gauchito Gil - the saints of the shirtless ones - with Tupac Amaru - last ruling 16th century Inca - printed under their pictures. When advocating for workers, Icons can be powerful, no matter that these individuals would have disagreed on many topics. For the next three hours we drove through a nearly unpopulated, treeless mountainscape. 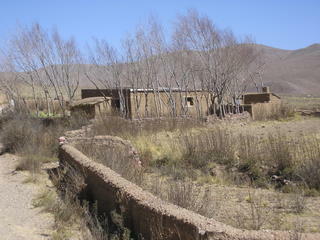 Occasionally we passed a farm with an assortment of stone and thatched roofed buildings, some in ruins. These multi-generational compounds have been lived in for centuries. As one building becomes obsolete, it's a convenient quarry for future structures. 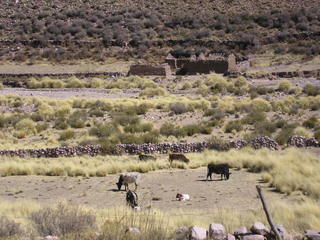 Sheep, goats and the occasional cattle graze the thin vegetation. Few, if any, electrical lines are visible yet it is not uncommon to see a TV satellite dish next to the house. Our guide had prepared a picnic lunch and pulled off the road into a protected gully - protected from the wind. At these elevations, the winds were 20-30 miles per hour with frequent gusts over 50. 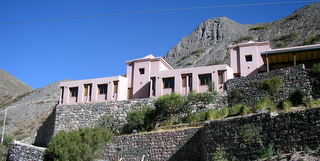 Our destination is ancient Iruya, with a population of 4,300 at an altitude of 2,780 meters (9,120 feet). 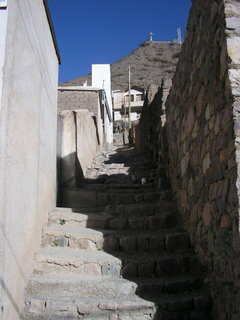 Perched on the mountainside high above the Rio Iruya, many of its streets are literally stone staircases. One attractive inn, Hosteria de Iruya sits at the very top of the village with spectacular panoramic views from both rooms and its restaurant. This is a town for anyone who wishes to do nothing more exciting than hike in the wilderness, read and think. 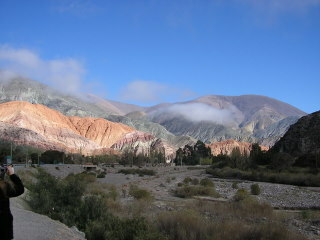 It is popular with Argentine tourist for its quiet, scenic location. 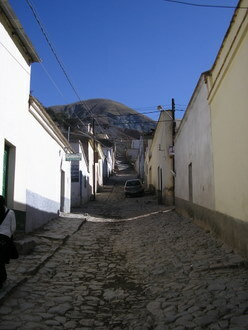 A four hour drive retracing our previous route brought us to the picturesque town of Humahuaca. Although a settlement years before the arrival of the Spanish, it's architecture is dominated by Colonial buildings. There's a lively local outdoor crafts market and an equally lively indoor food market where it's possible to purchase a wide variety of local produce, breads and meat products. The following day our excursion started by driving a few miles south to the historic colonial area of Hornillos with its early 18th century hacienda/post office/military outpost/government administration center, and, in the 19th century, train station. 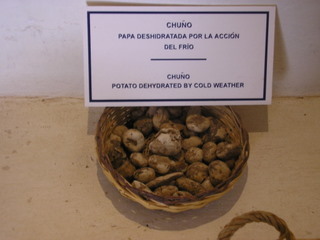 The Museo Historico Posta Colonial de Hornillos is as complete a museum displaying local life as you’ll find anywhere. 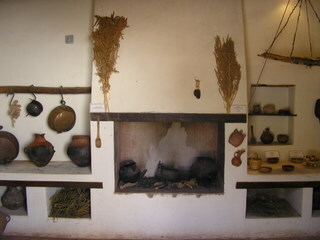 It has a well restored 18th Century kitchen with examples and bilingual explanations of the local grains and herbs that constituted a large part of the diet. 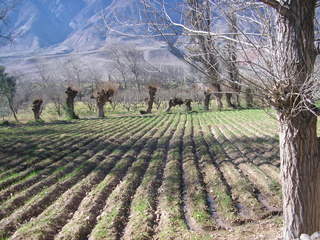 Outside are carefully cultivated fields using 18th century farming techniques. 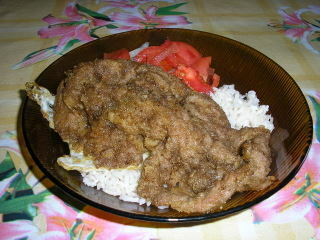 Admission is AR$3 (US$.80). We stopped several times over the next couple hours at scenic spots to take in the ever changing colors of the Quebrada rock stratifications and a popular road side outdoor market. 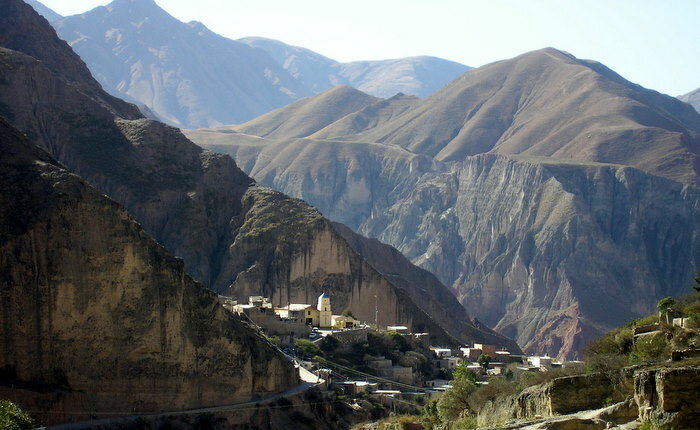 The village of Purmamarca has been discovered in recent years by affluent tourist who patronize well designed hotels and own an increasing number of vacation homes. Its river always allowed the village to thrive, and its setting amid the Quebrada is beautiful. 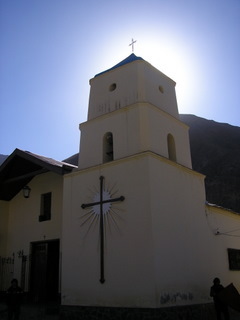 A visitor will notice more high end shops and restaurants in Purmamarca than in other Quebrada towns. 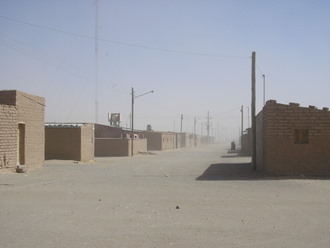 The well paved road that traverses this area of the Quebrada has become a busy commercial link with Chile. After several hours ascending the mountains, a road side marker indicated the highest point for this route, 4,170 meters (13,344 feet). 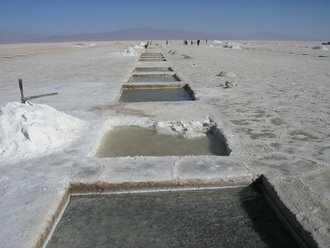 As the bus begins its descent the gleaming salt flats come into view. Amid the treeless, brown countryside, the vast Salinas Grande Salt Flats reflect the sun like an immense mirror. These are among the world’s largest and highest naturally renewing salt flats in existence covering an area of 3,200 square miles. The one foot or so thickness of salt rides above an equal salt lake fed by the meager few inches of rain this desert receives each year. It is privately owned by mining companies who freely allow visitors. The road to Chile runs right through the flats. 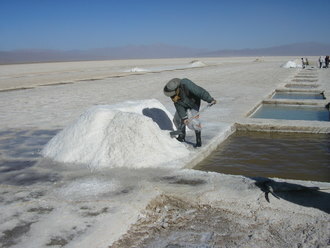 Salt extraction has gone on for decades using unchanged hand methods. A rectangle approximately 3 by 5 feet and 6 inches deep is cut by pick axe and the salt shoveled out and piled next to the ditch. At six inches, the water seeps in to fill the cut. 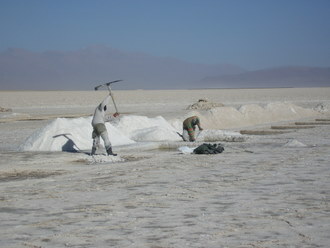 Within six weeks, the sun, which relentlessly shines over 350 days a year, evaporates the salt water and fills in the cut as if it had never been made. Walking on the flats is nothing less than other-worldly. In the thin winter air at 12,000 feet, the wind is biting yet the experience exhilarating. Sunglasses are necessary - the glare off the salt is blinding without them. The flats resemble cracked concrete except there’s a crunch under your feet. 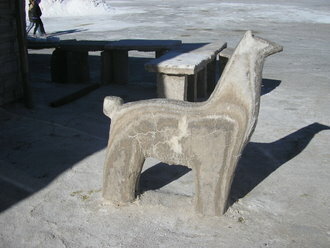 An outdoor crafts market selling small hand made sculptures from solid salt (they actually are carving them as you watch) is assembled several thousand feet in from the road. 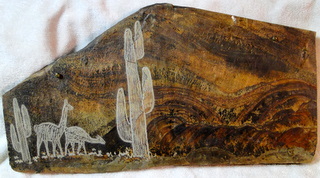 Etchings are made in slices of multi-colored Quebrada rock - a nice souvenir at an average price of US$20. A small café and restrooms are constructed entirely out of salt bricks. 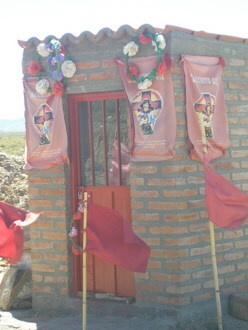 Comunidad Aborigen Tres Pozas, 13 Km de Salinas Grandes, is eight miles west of the flats, and the only human settlement for many miles in any direction. 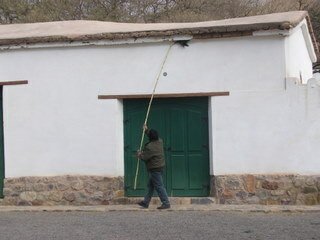 It’s the home for most of the workers and consists of a few dozen simple adobe buildings as brown as the surrounding desert. 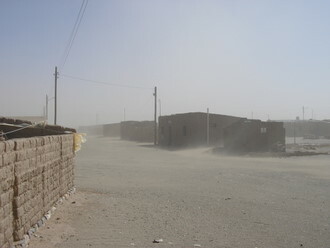 The winter winds were creating a sand storm. 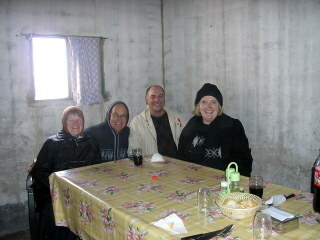 We went to the village for lunch and had to wait for 30 minutes for the one table (it sat a dozen people). During that time we learned how sand whipped by high winds can find its way through closed car windows and doors lodging everywhere inside your clothing, your mouth, nose and ears. Venturing out with my camera, I was lucky to have sun glasses that fit tightly around my eyes with a foam seal. 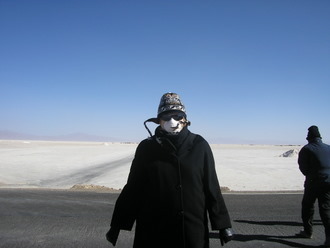 The silence was broken only by the tiny ping of grains hitting my jacket and hood as I watched the sand flow in drifts. The café, Comedor Las Guapas Salineras, is not an establishment any guide book would recommend for dining, but I’d highly recommend if you want to actualize that overused phrase an authentic experience. 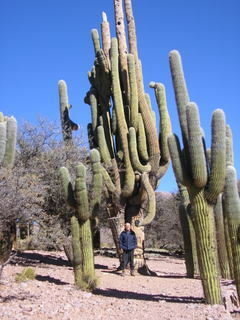 The education is startling and humbling as you can not deny the hard reality of life in the remote Andes. Yet for an absurdly small price, coupled with genuine kindness and effort, you dine on simple food - not particularly well cooked - in conditions few of us would ever accept.